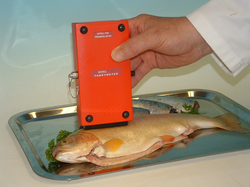 Exporter of a wide range of products which include fish fat meter and meat fatmeter. We are a trustyworthy organization offering a wide a gamut of Fish Fat Meter. Material ABS Plastic. Waterproofed to IP 65. Size 195mm x 100mm x 40mm. Weight (Incl Batteries) 725 gms. Microprocessor Operations controlled by new microprocessor. Memory Up to 80 Calibrations can be programmed in each meter. PC Interface Stored data sets can be transferred to PC, via data cable supplied… both in “real time”, and as “historic data”. Software Data Management Software packages are supplied with each meter. We are a trustyworthy organization offering a wide a gamut of Meat Fatmeter.